We had a great event with a total of 35 young people between 12 to 16 years all represented. The majority of the youth came from Mathare North and Mukuru in South B. The event took place at the GoDown on 11th December 2016. Our main theme was My country, My future. We aim at creating a positive dialogue that will promote the values that will foster peacefully coexisting of people. Games – Games are an important tool to use in fostering interest and interaction amongst the participants. The youth got a chance to introduce new games to the rest of the team. Our main objective was to have fun and bond together in readiness for the day activities. Group challenge – We formed five groups of six participants and the challenge was to build the tallest tower using the resources provided. This challenge helps the participant to listen more, work in teams, and work on time management among other soft skills. Brainstorming – This process helps get divergent views on a specific topic. Our main topic was what makes Kenya great? And also looking at what we should change as Kenyans? 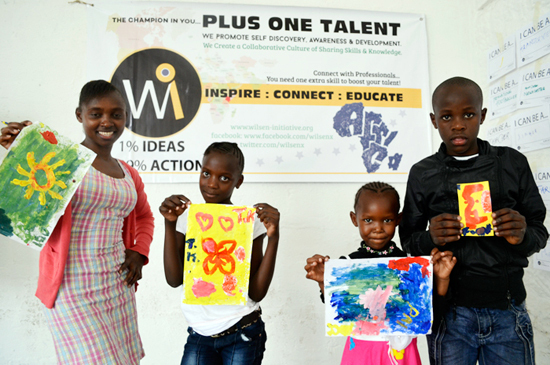 The two sides of a coin tapping into the young people’s mind and activating their voice through painting and discussion. 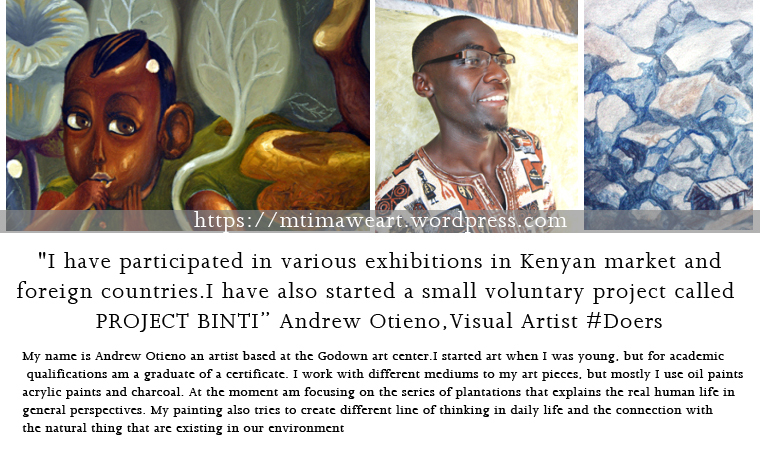 Painting – Appreciate art as one of the greatest mediums of expression. Art in school isn’t that strong like it used to be back in the 1990’s we want to bring this important aspect of expression and learning to young people as a way of unlocking their potential through critical thinking, creativity and innovation which might not the primary goal in most of the schools administering the 8-4-4 system. Last we had a break out session with refreshments before the closing session. In a special way I want to thank Kate Syprine (Co-founder Wilsen Initiative), Janet Nawire, Andrew guest tutor, Edwin our videographer, GoDown Art Centre, Dorwaf restaurant and the Pollination Project for making the day a success. These are questions that we seek to address using the Wilsen Initiative Model (Wi) as expressed through our mission and vision. Our vision is to have a society of self-confident young people who inspires positive change using their talents and skills for prosperity. How we develop a more sustainable vision of success. How might we internalize in people the motivation to develop a more sustainable vision of success. How might overcome the “sheep factor” towards skills develop in achieving personal genuine potentials. How might we define Kenya’s success? How might we have short term gains that will leads into long term solutions? 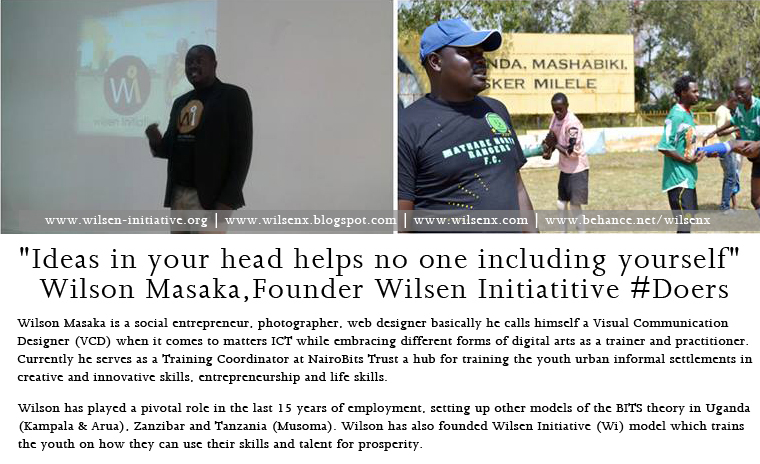 At Wilsen Initiative our happiest moment is when we help young people transit into new experiences in life. Soccer / football is one of our vehicles that we use to reach out to young people discover more about themselves (gift, skills and talent). Accessing good football pitch, lack of resources, lack of enough opportunity, low self esteem, minimal positive role models are among the hard faced challenges. Yesterday we were able to create these positive chains of events by successful finishing the two week football/soccer tournament for U12 and U14. We awarded the winners with our branded Wilsen Initiative (Wi) jerseys, football and football shoe for the overall best player. We thank the young people who worked with us tirelessly in organizing the tournament and the Pollination project for believing in our theory of change. #ComingSoon This Sunday we shall host 30 young people through an artistic expression workshop at the GoDown Arts Centre. 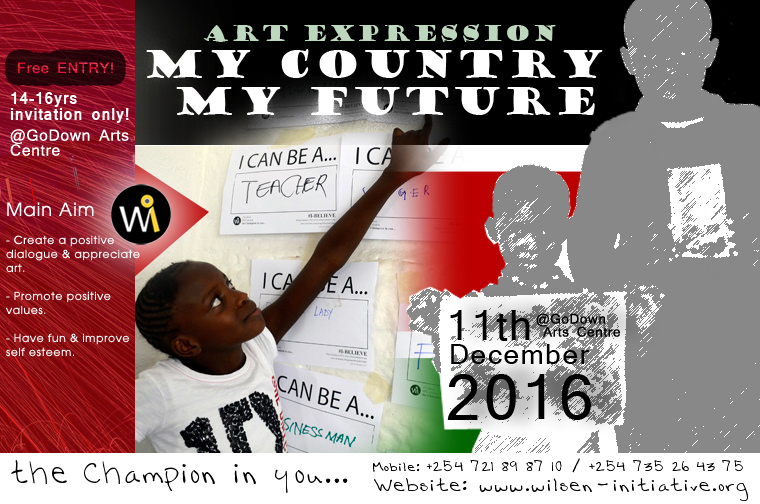 This is a platform that will bring young people of 14 to 16 years together at the GoDown Art centre on the 11th of December 2016. Our main theme My country, My future aims at creating a positive dialogue that will promote the values that will foster peacefully coexisting of people. Next year we will be having the general elections and from the street talk and media there is little evidence in organizing a celebration of things that bind us together as Kenyans apart from the forthcoming Jahmuri day celebration on 12th December (Independence day) which is gazetted. It is so unfortunate the small gains and activities such as what we have organized doesn’t get the attention in the mainstream media, majority of top news is when remarks are made that are controversial to the norms are made especially towards polarizing us further through tribal affiliations, political affiliation etc. Thanks to the new media, we are able to share our passion, activities and create platforms that appreciate our diversity as Kenyans even in a little way and as key stakeholders of the Kenya that we want to see.